Partly cloudy. Gusty winds diminishing after midnight. A stray shower or thunderstorm is possible. Low 39F. Winds WNW at 20 to 30 mph.. Partly cloudy. Gusty winds diminishing after midnight. A stray shower or thunderstorm is possible. Low 39F. Winds WNW at 20 to 30 mph. Welcome to Tehachapi. We are honored that you have decided to explore our community further and experience what we have to offer visitors like yourself. Tehachapi is definitely horse country, but facilities and available areas to ride are mostly private. Exceptions are trails in Mountain Park, operated by Kern County. Both Bear Valley Springs and Stallion Springs have extensive equestrian trails available for residents. Starting a vineyard from scratch — doing what hadn’t been done before — wasn’t the hardest thing, Bob Souza recalls. It was doing it all alone. Tehachapi is full of rich history, and that history is displayed in the town’s museums, which are full of art, exhibits and many more treasures. Through these museums, visitors learn how Tehachapi has become the town it is today. When it comes to fresh produce, Tehachapi does it right with the town’s annual farmers markets. The game of golf is a popular way to pass the time in Tehachapi, thanks to scenic mountain vistas and ideal climate. When it comes to wildlife, Tehachapi has it all, from horses to alpacas to cats. There are a number of rescue organizations, ranches and horse trails for all visitors to explore. Tehachapi's main shopping districts are Central Tehachapi, West Tehachapi and Old Town. At the time it was constructed, the Tehachapi Loop was considered an engineering marvel. Even now, it still draws visitors from around the world who want to see that famous landmark many simply call The Loop. If one were to venture through Tehachapi on a weekday evening, especially on Friday nights in the fall, it wouldn’t quite be a ghost town, but it wouldn’t be a busy scene either. Most of the Tehachapi community won’t be at work, out and about, or even at home. 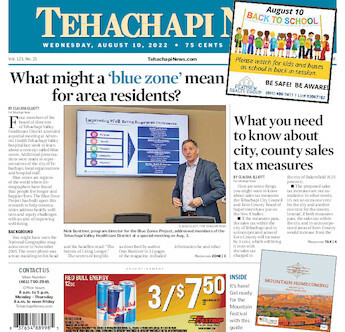 The city of Tehachapi is an ideal destination for people and families of all ages, offering affordable housing, low crime rates, clean air, favorable weather, and a close-knit community to lean on. The historic Downtown Tehachapi Walking Tour is in the heart of the community. It's easily walked with numerous restaurants, shops of all kinds and museums along the way. Tehachapi is home to myriad events and festivities that encompass multiple interests. Both tourists and residents will be greeted with consistent entertainment and attractions all year long. Below is a listing of these events by month. One can take for granted how easy it is to travel the length of California, but before 1876, the way to and from Los Angeles and the Bay Area had a mighty obstacle: the Tehachapis mountain range running east-west in the southern San Joaquin Valley, between the Sierra Nevada and the Coast Range. When curator Doug Pickard calls the Tehachapi Depot Railroad Museum “the centerpiece of the town,” he means physically, given its location in the heart of Tehachapi. But with the railroad running deep in the town’s history, it’s a fitting description of the museum metaphorically as well. There's a reason Tehachapi is known as the Land of Four Seasons. This year marks the 55th year the Tehachapi Mountain Festival will provide quality family entertainment for the community. And this year’s event is going to be great, with a new "Music, Mountains & Memories" theme. Avid cyclists should mark their calendars for this September as more than a thousand riders — locally and from around the world — come together in Tehachapi for the Gran Fondo. Tehachapi's beautiful blue sky is favored by pilots and can be enjoyed by visitors, as well. Tehachapi is a great place to have a wedding, family reunion, special event or a business retreat. Some hotels, restaurants and churches have small meeting rooms and many local restaurants offer catering. Just a few minutes southwest of the city of Tehachapi sits a secluded patch of heaven hidden in the clouds. A peaceful atmosphere pervades the beautiful 470-plus acre property of the Bethlehem Priory of St. Joseph, a convent of cloistered, contemplative Norbertine nuns.